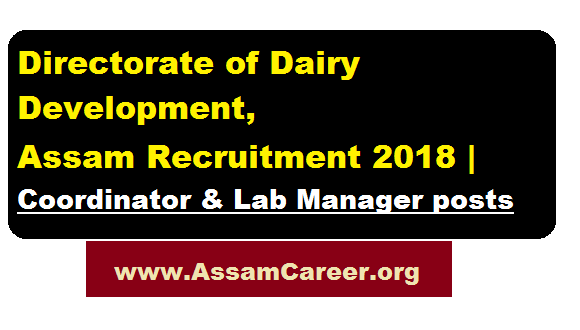 Directorate of Dairy Development, Assam Recruitment 2018 September| Coordinator & Lab Manager Positions :- The Operational Project Implementation Unit (OPIU) – Directorate of Dairy Development, Assam intends to hire the following manpower on purely contractual basis under the World Bank financed ‘Assam Agribusiness and Rural Transformation Project’ (APART). The minimum required qualifications, experience, age and annual remuneration ranges for the positions are given below. In this section, we will discuss in details about the recruitment of Lab Manager & Coordinator Posts under Directorate of Dairy Development, Assam September 2018 Recruitment with vacancy details, eligibility criteria, salary with other details and requirement. Educational Qualification: Candidates must have Master Degree in Dairy Technology/ Dairy Science/ Veterinary Science of minimum two years duration or a closely related field from a recognized University/ Institute. Experience : At least 3 (three) years of experience in project planning, coordination and management in the relevant field. Age Limit : Not more than 35 years as on 1st July, 2018. Experience : At least 2 (two) years ) hands on experience on microbial techniques and chemical analysis of food & beverages. Potential candidates from India having the requisite qualification and experience may apply in English language strictly as per the prescribed application format provided in the above websites along with a cover letter, in a sealed envelope indicating “Application for the position of ——————–” so as to reach the address given below on or before 12-10-2018, along with a soft copy through email to: opluapartddd@gmail.com before the deadline mentioned. Only the short-listed candidates will be called for interview/ test. Canvassing in any form will lead to disqualification and rejection. Notes: (i) Candidates not meeting the Qualifications & Experience need not apply; (ii) The Director, Dairy Development, Assam reserves the right to increase or decrease the number of positions or scrap any or all of the positions.